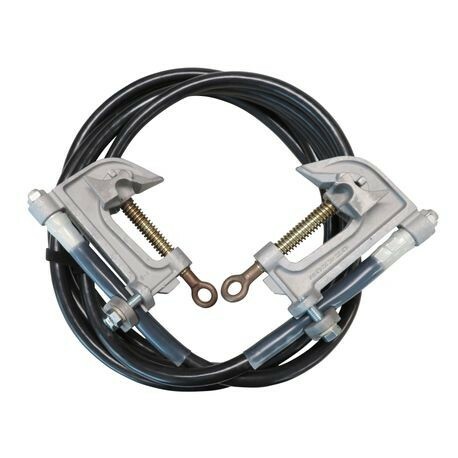 BLACK JACKETED TIN-PLATED COPPER WIRE GROUND SET (Length: 10', Cable Size: 4/0, Clamp: T600-0658) | Tallman Equipment Co., Inc.
Standard ground sets can be ordered in any length. Each is made with threaded, tin-plated copper ferrules and clear heat-shrink tubing covers the connection between the wire and ferrule. Ground sets made with #2 and 1/0 cable are supplied with 1-1/4” capacity clamps Part# T600-2708. 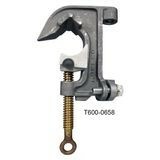 Larger ground sets are supplied with 2” clamps Part# T600-0658. Each ground set is labeled with the date of test and assembly along with a unique serial number. Your company labels and serial numbers can be used. Most ground sets made with in stock components can ship within 24 hours. Tallman can clean, test and certify your used ground sets. Hi-Visibiliity Ground Flags avalaible here. If you don’t see what you need, we can manufacture custom ground sets for any application, contact us for more information 630-860-5666.